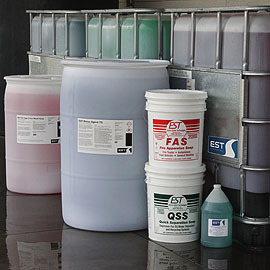 EST offers a wide variety of chemicals for cleaning and washing everything from aircraft to forklifts. Available in 5 gallon buckets, 30 gallon drums, 55 gallon drums, 270 gallon totes or bulk delivery. Apply with a pressure washer, high flow foamer gun, concentrate spray or automatic truck wash system. QSS II (Quick Separation Soap) is a completely biodegradable industrial detergent. QSS II is made to clean and degrease vehicles and farm, oil field, truck and other tough equipment cleaning applications. QSS II can be used to clean food preparation areas, always be sure you rinse thoroughly with cool, potable water after cleaning. QSS II is a quick release agent safe for use in recycle systems and with oil water separators. QSS II contains Scale Trol to protect machines from scale and hard water build-up. QSS II contains Complex Phosphates, Sodium Metasilicate, and natural citrus degreaser. 2. EST PS Type II Car Wash Soap is a detergent concentrate for foam brush and cloth applications. EST Rinse Agent 75- Drying agent used in the last stage of automatic wash systems and truck / bus wash systems. EST Rinse Agent 75 can be used in friction and frictionless automatics and self serves. 4. EST 775 Alkaline Presoak is a cost effective alkaline presoak. Used in touchless truck wash systems an effective presoak. Can be used as tire and wheel cleaners and degreasers. 5. EST S35 Truck Wash Presoak is a highly concentrated, heavy duty alkaline detergent. Multiple applications such as a touchless presoak, tire cleaner, and wheel cleaner for both touchless and friction automatics and conveyors. Designed with the latest technology in road film removal, this product produces cleaner and shinier glass, paint, wheels, white walls, raised letters and black tires. Biodegradable, phosphorous free and nonylphenol free. For foam or wet application in friction washes as a presoak, foam shampoo, or detail gun prep soap. Has multiple applications in self-serves as a presoak, power wash, tire cleaner, and foam brush soap. Specially designed for safe use on aluminum when used at recommended levels. 8. EST Elite Powder is available for self-mixing or in premixed drums or totes. Powdered detergent designed for both friction & frictionless cleaning. Has excellent solubility in pre-blend tasks. Can be used as high pressure prep soap and dry end tire cleaner. Great for pre-soak applications in high pressure touches systems. 9. EST Low PH Pre-Soak is used for the first step of a 2 step wash. This aggressive product contains no HF or ammonium bifluoride. Instead it uses other acids to effectively remove tough road films and leave paint and glass cleaner and shinier. 10. EST De-Foamer is fast acting and prevents future foaming. Formulated specifically for treatment systems.